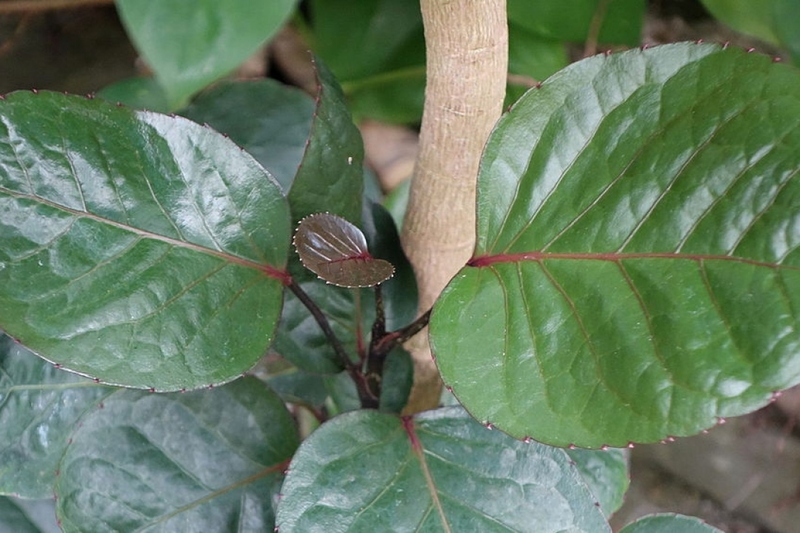 Shield Aralia (Polyscias scutellaria): growing, planting, caring. A popular species, alas a little tricky in care : easy to over-water - and requiring a constant humid and warm atmosphere. The distinct leaves of a Balfour Aralia resemble leathery, round, dinner plates about 1″- 2″ in diameter, which is how the plant got one of its nickname, the Dinner Plate Aralia. The leaves range in color from light green to dark green and some varieties have green and cream colored variegated leaves. Polyscias form a shrub with a thick trunk, and leaves grouped in tufts, rounded or oval, toothed or sometimes cut. The entire plant reaches 60 cm to 2 m. It is often used to form bonsai. The polyscias likes moderately humid environments: it adapts rather well inside our houses and our apartments. It needs light but no direct sun. Avoid the tanks with water reserve, it hates stagnant water. As soon as the soil becomes dry on one centimeter, water so as to moisten all of it. During the growth period (spring, summer), watering should be regular - once or twice a week - but measured in order not to asphyxiate the roots of plants. In the fall, space the waterings gently, until winter when a simple influx of water once a month should suffice. A simple pruning, which will give a boost to your polyscias! You can do a simple spring refresh, by shortening most branches to make them fork, or more drastically removing bare or dry branches. If you have polyscias in bonsai, cut it every two months, slightly. At the end of winter every 2 years, repot your polyscias! You can also repot before, especially if the roots are overflowing from the pot. Choose a pot of larger size, about 5 cm wider than the original one - a heavy clay pot that will balance your plant: polyscias has a very high center of gravity, so it tends to fall. First, sprinkle the original pot, put into the new pot clay balls or small stones for drainage, and add special compost for interior plants, mixed with a little soil from the garden. Remove the polyscias from its pot. If the pot does not give in, you can cut it with a pair of scissors or secateurs, Remove the roots, position the mound, and fill with compost for interior plants. Tamp rather strongly, and water at last! If you have the opportunity, place your polyscias outside, in semi-shade during the summer. Bring your plant in at the end of September, in a bright place at an ideal temperature of 18 to 22 ° C, near a window but not in full sun, and avoiding cold drafts.